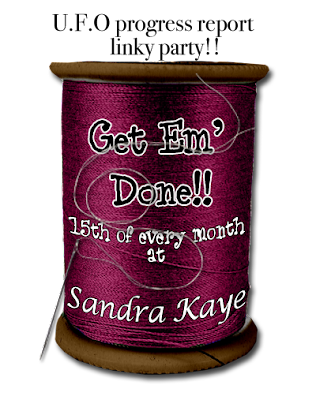 Sandra Kaye: Let's Get Em' Done!! The quilt is fabulous ,I love the bag,would make me a lovely makeup bag. What beautiful things you have made this month. You know, I was thinking it's been a while since I've sewn, and now that it's linky time - I see I haven't done anything in a whole month! I have nothing to post and link this time. Bella is too cute! 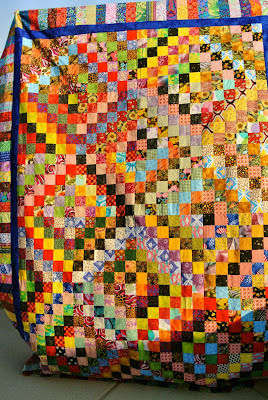 The quilt looks great...and I love how the bag finished. I have yet to start muine...have everything bought...just need to cut and get to it! Hi Sandie. I have been so absent from blogland for a couple of months. Nice to see your work here today. Bella is super cute. I had a Poodle when I was younger, her name was Brandy and I loved her sooooo much. She unfortunately go too big for our home and we gave her to a family who lived on a farm. Now I have a little 6 1/2 pound toy poodle named Mila, she is 10 years old now. Not so much a puppy but still cute as a button! Enjoy Bella ~ the first year is the hardest but once they are trained it's all fun, fun, fun! You're right. Bella is too stinkin' cute! the batik quilt is beautiful, can't wait till you quilt it. 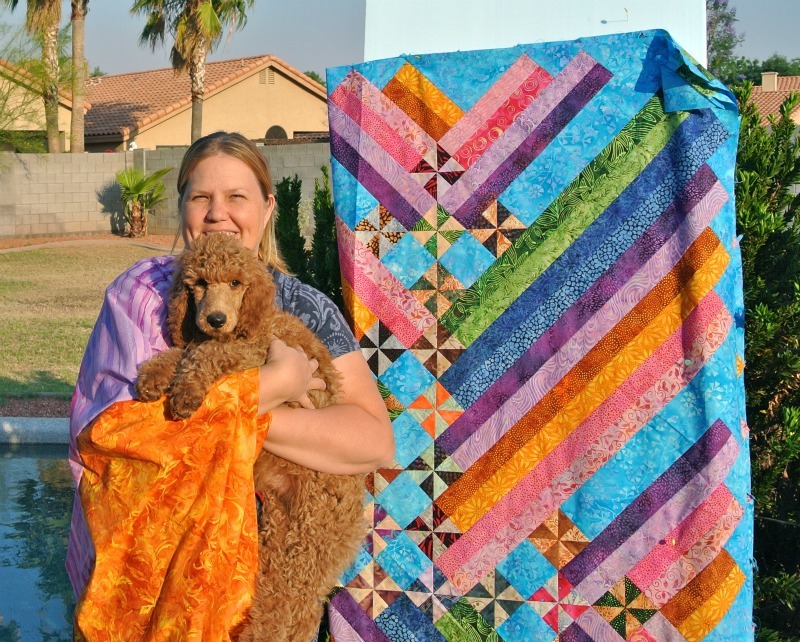 Sandie, your quilts are gorgeous! 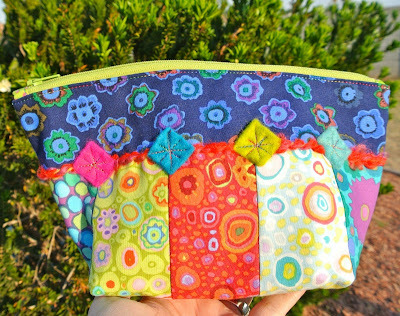 And love that little bag! 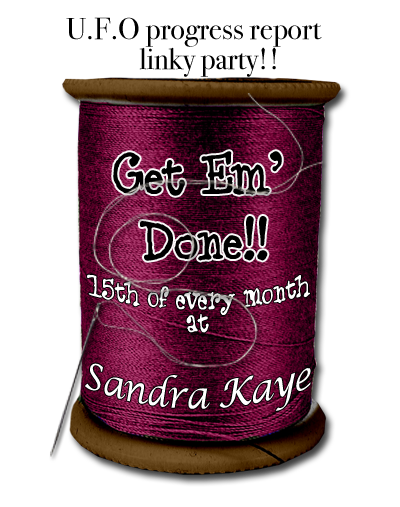 I have been away for a few days and need to 'catch-up' on lots of my projects. The faster I go,the behinder I get! Your 'little' pooch s a cutie! Gorgeous colorful works of art! Oh boy new puppy is just gorgeous! You look so happy!!! Oh My, Bella is so cute! Lots of Love There! Apart from your quilts looking so gorgeous so is that delightful Bella! What a beauty she is - is she a standard poodle? We have an apricot poodle also - Lilly - she runs everything! Our older apricot poodle died last year at 17.1/2 yrs and I still miss her! They are so human like in so many ways!